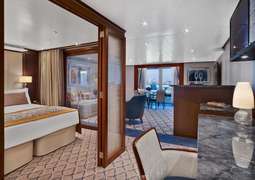 The Seabourn Encore is the newest ship in the ultra-luxury fleet. 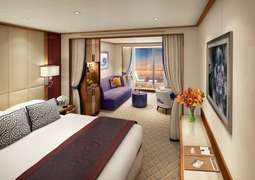 It offers the same exclusive, small ship cruising which guests have come to know and love. Seabourn Encore is as strikingly beautiful and as excitingly innovative as any Seabourn has ever debuted. It is part of a fleet that is already the newest, most modern and most acclaimed in the ultra-luxury segment. The cabins are rich in thoughtful details such as roomy closets, comfortable seating and sleeping areas, elegant bathrooms, a well-stocked in-suite bar and personal entertainment options. Enhanced by the vision of Adam D. Tihany, the sophisticated colour palette, choice of fine fabrics, rich materials and lustrous finishes found in guest accommodations reflect Tihany’s master touch. ”The Restaurant” is a beautiful fine dining venue. It offers a wide variety of French-American dishes inspired by Thomas Keller and prepared to order by Seabourn's talented chefs. Breakfast, lunch and dinner are served on an open-seating basis, inviting guests to dine when, where and with whom they wish. There is also a sushi restaurant which serves modern and authentic sushi and Japanese fish dishes served à la carte style. For something more casual, try “The Patio” for salad, lunch buffets and freshly baked pizzas,´. The Retreat is a tranquil flower shaped canopy with 15 private cabanas. They offer private, individual, luxury spaces each with a large HD television and well stocked refrigerator. The cabanas surround a central heated whirlpool. The Spa and Wellness centre offer treatments for both mind and body, all designed by Dr. Andrew Weil.